Our thank-you lunch for Josie! As a teen involved with the staff and programs at Youth Unlimited for the past 3 years, I was nervous about joining the team as an intern. My biggest fear was that I would to be treated like a kid instead of a full team member. These worries were quickly removed when I was asked to help with a variety of projects I would have never imagined doing. I was able to engage in fundraising for coworkers, be apart of preparing for major projects that are starting up in the fall, and was assigned normal, everyday tasks that youth workers have to do on a regular basis. I really felt like a part of the team. Out of everything, fundraising was my favorite. 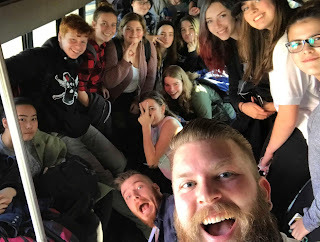 Now, it could be because going out for coffee is one of my favourite ways to pass the time, but when going for coffee is combined with talking about how Langley Youth Unlimited staff made an impact in my life, I get really excited. Of course sharing my story with random strangers can be a tad bit nerve-racking, but it also meant that more support might come for helping youth like me. The way that I see it, being a youth worker at YU takes three major things: a passion for youth and God, support from community members, and constant communication with the Lord. If one of these things is missing the job just can’t get done. It was really fantastic to get to see each and every aspect come into play this summer. To me this was more than just an internship. I was pushed to explore my faith, put all my trust in the Lord, and to seek if this is the path that God wants me to continue on. With pursuing God constantly and looking more in depth at my faith, God revealed himself to me in ways I never thought possible. This internship did a lot to challenge me and I’m excited to see where this journey will take me next.